Yet another Ontario Ghost Road. 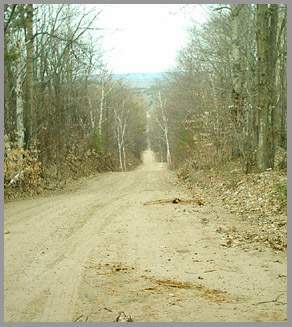 Buck Hill is located in the Ottawa Valley approximately 90 km from Pembroke and nearby to Algonquin Park. It is the location of many reports of ‘spooklight’ activity (see below for an example), which is attributed by some to a ghost story. During the depression and a particularly harsh winter storm a logger returned to his home and family. He cautioned his wife and young daughter to remain indoors while he went out to fetch some firewood. Upon his return his wife told him that their pet dog had gotten out of the house and the girl had ran out in order to call him back and had not yet returned. The anxious father grabbed his lantern and began to search for his missing child. The family lived on Buck Hill road and the distraught parent searched up and down it to no avail. The young girl had simply vanished into the stormy night never to be seen again. As legend has it the logger who went mad with grief never gave up his search, and would comb the area nightly with his lantern until his death. Some locals in the area believe his search continues to this very day and refuse to go near this isolated, logging road. At this time we have no corroborative historical facts that would support the ghost story. However, people have reported seeing balls of light, some at very close range at this location. The ‘lights’ are described to be either white, amber or green and approximately the size of a baseball. Occasionally these lights are bright enough to light up the forested area and will flare up as if increasing in size and luminosity before eventually disappearing. Please see ParaResearchers Of Ontario for in-depth witness testimony. Our thanks to ParaResearchers for the photo you see above.